It always shocks people that I’ve found so much of my everyday dainty gold jewelry on Amazon for under $100 (not sponsored – I wish! Just have to share!). Since I’m not one to withhold my shopping secrets, I wanted to spill all the details on the best dainty gold jewelry pieces I’ve found. These delicate and classic earrings, rings, and necklaces are perfect for wearing nonstop. This is for the glitz and glam lovers who always need solid basics and for those just looking for an everyday touch of sparkle! For starters, it’s important to be educated about the descriptions of these pieces. You’ll see gold-filled, gold-plated, or solid gold pieces. Each will make a difference in the price and durability of your purchase. Gold-filled and gold-plated are alloys that blend gold with another base metal such as brass or sterling silver. Gold-filled typically lasts longer than gold-plate and doesn’t tarnish as quickly. Brass tends to break out people’s skin, so I always buy gold-filled with/over sterling silver! Real gold is the real deal that definitely won’t tarnish. You’ll see that the price will increase as the quality of gold increases. I purchase 10K and 14K gold pieces for more affordable everyday pieces. 18K and 24K are really nice but involve a much heftier price tag! These $21 teeny tiny gold ball studs are perfect if you have more than one piercing on each lobe. With three piercings per ear, sometimes other earrings can interfere if I want to wear statement earrings up front. I pop these studs into piercing two and three to have something there but to not distract from the earring in piercing one! I spent well over $50 on a pair of earrings like these before I discovered this $9 pair! These add an edge to your look and something different with the dangling spike! A lot of the time I like wearing three hoops on each ear. I have been so impressed with the quality of these pave CZ hoops and have worn them for weeks on end. These black pave hoops just came in, and I haven’t taken them out since! A pair of rainbow pave hoops (and these ear threaders!) are on their way to me, so I can’t wait to wear the white, black, and rainbow hoops all together! My mom will call me “Ringa” (a play on Ringo, ha!) when I’m loading on #alltherings. I don’t know why, but I have been drawn to rings as long as I can remember! 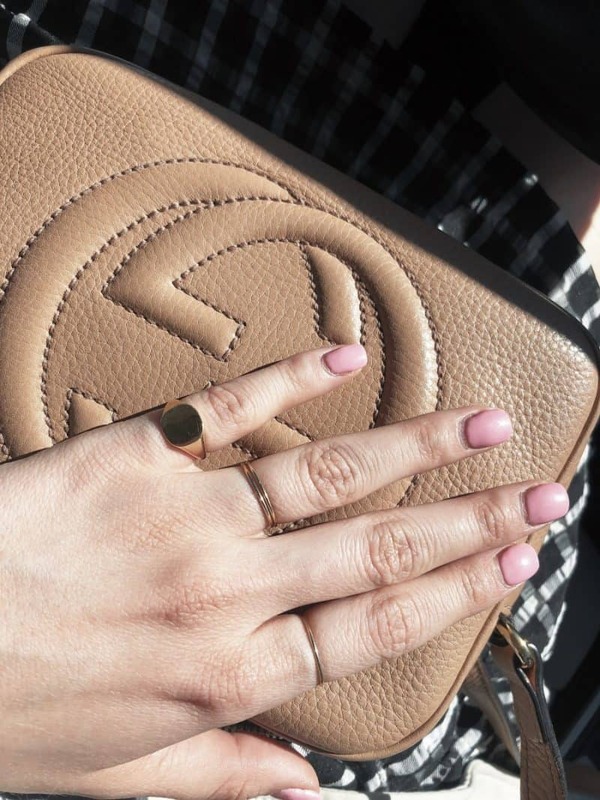 I love simple, dainty gold jewelry when it comes to my rings, too. Always go for the classics so that they’re easy to style and go with everything you wear! Wear this gold wedding band style ring as an everyday, classic statement. This rope-textured ring is inspired by a David Yurman version and less than half the price. This would be a great stacking ring if you ordered more than one. Or a great texture for mixing and matching! I also love wearing whisper-thin gold rings all over my fingers like in the photo above. This $18 version from Amazon is to die for. Click on the seller’s name to find the ring in your size! (I bought mine from Etsy.) Buy a few in your ring finger size and then a few bigger to put on your pointer, thumb, or middle finger! My pinky ring was custom made for me as a gift, but here is a very similar version for under $65! 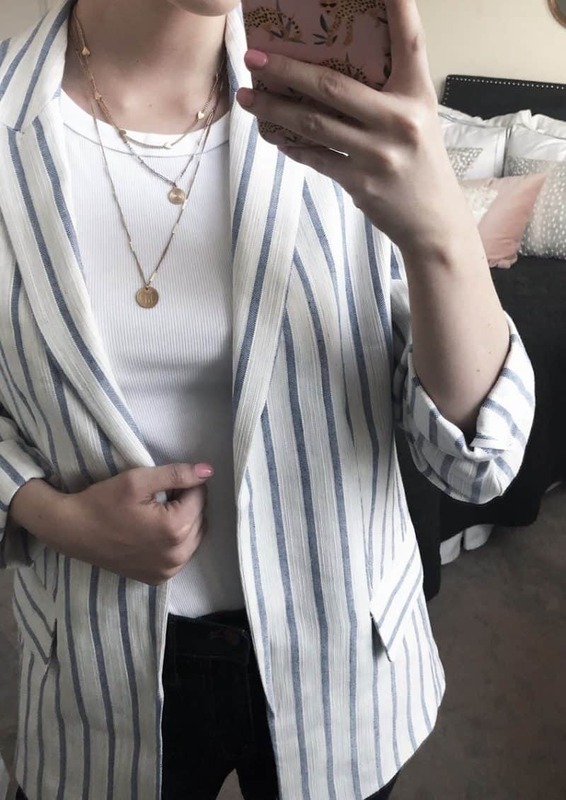 Who else can’t get enough of the layered coin necklace look?! I think it’s so chic while also being so cool and on trend. To get the layered look, try to space them out by necklace length. I usually go with a 16 inch, 18 inch, and 20 inch when I’m wearing my layered coin necklaces. This way they won’t be laying right on top of each other! Here is a $23 coin necklace that would be a great way to start or add to your layering! Then consider adding in an oval shaped option in like this. As I mentioned, I’m not usually one to go for gold-plated brass pieces, but this necklace is said to be made with high-quality brass that does not cause breakouts. This $12 necklace reminds me of the Missoma version and would be a really cool addition to a layered look! I’m always one to go for a personalized touch. This initial disc necklace is a must-buy for $8 or this one for $15! I’ve found that shopping for children’s gold jewelry can lead to some major price cuts and steals! This rosary-style necklace is so cool and makes for a simple statement all on its own! It’s also always a classic and easy move to just wear a simple, elegant gold chain. I love the open link look of this one. Or this ball chain style could add some texture! You can never go wrong with something simple with just one pendant like this one! Here is a dupe of the Tiffany’s Elsa Perretti heart necklace for $75! This would make an amazing Mother’s Day gift. This gold bar necklace would be amazing on its own or a great option for engraving to personalize it! Last but not least, I have been loving Amy (Fashion Jackson)’s and Ashley (The Teacher Diva)’s delicate ball chain bracelets. I was thrilled when I found this $10 version on Amazon! I ordered two to stack them. I hope these affordable, dainty gold jewelry finds add a luxe touch to your everyday look. I always link my jewelry and accessories here or on my LIKEtoKNOW.it profile so that y’all can stay updated! P.S. You may not know that I’m a bit of a junkie when it comes to discovering deals on Amazon! Don’t miss my post on the best designer dupes you can find on Amazon. Think amazing dupes for the Goyard tote, Valentino shoes, and more!